The 2013-2014 NBA schedule was released last week and fans of the Association are in for a treat with numerous prime time games between All Stars from Opening Night right up until the playoff push. We broke down every schedule and have compiled a list of the best game in each month. These are sure to be the games that will have Twitter buzzin’, jam-packed bars and the ticket prices inflated. 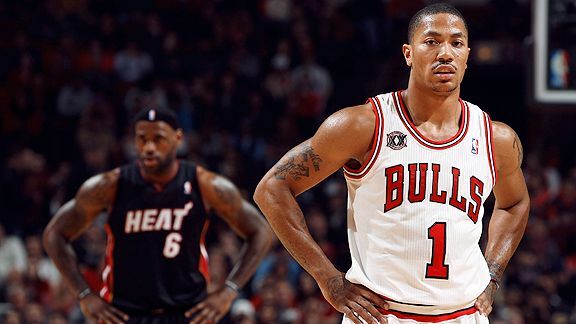 Fans in Chicago haven’t seen their MVP point guard Derrick Rose compete since he went down with a torn ACL in a playoff game against the Philadelphia 76ers on May 12, 2012. All eyes will be on Rose to see how his game has been affected by the injury and if he can reach the All Star caliber expectations he has set for himself with his young star studded career. But let’s not forget who is on the other side of the ball. The Miami Heat will raise their 2013 NBA Championship banner and receive their rings prior to the game for the world to see. LeBron James and Dwyane Wade have proven their skeptics wrong and are looking to write their names in the history books with a three-peat. San Antonio is fresh off a discouraging game seven loss to the Miami Heat, but the Spurs will still be competitive this season despite their age. Their experience, led by Tim Duncan and Tony Parker, along with the up and comers Tiago Splitter and Kawhi Leonard will help contribute to the Spurs’ win column. Memphis is looking to forget about their disappointing sweep against the Spurs and get revenge in the rematch of the 2013 Western Conference Finals. It is their first time playing San Antonio in the season and fans in the FedExForum will surely be loud and boisterous. Both teams will undoubtedly be battling all season long for supremacy in the Western Conference. A few blocks down from the Rockefeller Center Christmas Tree, Madison Square Garden will host the best game for the NBA Christmas Day lineup. Carmelo Anthony has always stepped up in big games and delivered. The Brooklyn Nets stole the spotlight in New York this offseason, and the Knicks will need to prove themselves to their city and across the country that they can make a legitimate playoff push in the East. The Oklahoma City Thunder is no stranger to prime time games and will be led by Kevin Durant. Durant and Anthony are destined for an epic shootout and whoever can get the most help from their bench will likely be the winners. The Thunder is hoping to get back to the championship level they attained in the 2011 season after losing in the second round to the Memphis Grizzlies. Paul Pierce and the Brooklyn Nets will travel to Boston where he will play the franchise that drafted him and he spent 15 years with. It will surely be an emotional day for Pierce as he takes the parquet floor of the TD Garden in an opposing jersey. Anticipate a welcome and sympathetic Celtics crowd, which will be put through the ringer this season. Rajon Rondo is on pace to be in uniform by January, a full calendar year after he tore his ACL, and will be the new face of the franchise going forward. The Nets are looking to combine the powers of their new stars Pierce and Kevin Garnett with the incredible talent they already had in Deron Williams, Joe Johnson and Brook Lopez to bring a championship to the borough of Brooklyn. Look for Pierce to put on a show in his old stomping grounds. Dwight Howard was THE talk of the offseason and the Lakers threw everything but the kitchen sink to retain the superstar that averaged 17 points a game in the purple and gold. Howard instead went to the Houston Rockets, where he will play alongside shooting guard James Harden. The Rockets look good on paper, but must learn how to play as a cohesive unit if they want to be competing in June. The Lakers definitely are not the same team that competed on the highest level just a few years back. Although Howard was heavily criticized during his short career in LA, he did make the team better and was a huge presence on the boards with 10.8 rebounds a game. Kobe Bryant will miss time with a torn Achilles tendon, but has already made an impressive recovery. Safe to say this game is one that No. 24 is hoping to be ready for. This game will mean so much for each team down the stretch of the NBA season. The Rockets will be trying to prove their assembly of super stars can compete with the likes of the Heat’s Big Three. Houston will likely be in a dogfight with Oklahoma City, San Antonio and Los Angeles (Clippers) for playoff position in March, and all the games at this point in the schedule will start to have much more significance. This game will also be significant for Miami. They will play eight games in 14 days leading up to this game in March, and will surely be hitting the rough stretch of the NBA season between All Star Weekend and the playoffs. They must stay sharp and focused in March and April to protect their expected No. 1 seed in the playoffs. The Battle of the Boroughs will have one final showdown in Manhattan before the playoffs begin. Although both teams are destined to make the Eastern Conference playoffs, this game will definitely have an impact on what seeds they end up with. The Knicks and Nets split their series last season at 2-2, with exciting games that went down to the wire. Teams usually will rest their star players the final week of the NBA season, about a week and a half after this game. Watch for the final push and an entertaining game by both teams’ superstars in this matchup at the Garden. This one might also decide final bragging rights in the Big Apple. This guest post was contributed by Heather McDevitt — she is a Boston Celtics fan with a BA Public Relations from Penn State.